During a recent trip to Cancún, I was able to scratch one really fun item off my bucket list — I was able to swim in a cenote (underground cave) for the first time. And yes, it was just as cool as it sounds! I visited Cenote Hubiku, which lies deep in the jungle of the Yucatán Peninsula. Cenotes are underground limestone caves filled with fresh water, plus all sorts of other interesting things. Some contain fish, some contain treasure, and some even contain human remains — which you'll read more about below! Cenotes are very similar to what we refer to as sinkholes or “swimming holes” here in the U.S. The two swimming holes in Texas that most closely resemble the cenotes you'd find in Cancún are Krause Springs and Hamilton Pool — although the Texas ones are both above ground. I went on this particular trip with my best friend, Christopher, so you'll see him in many of my photos. 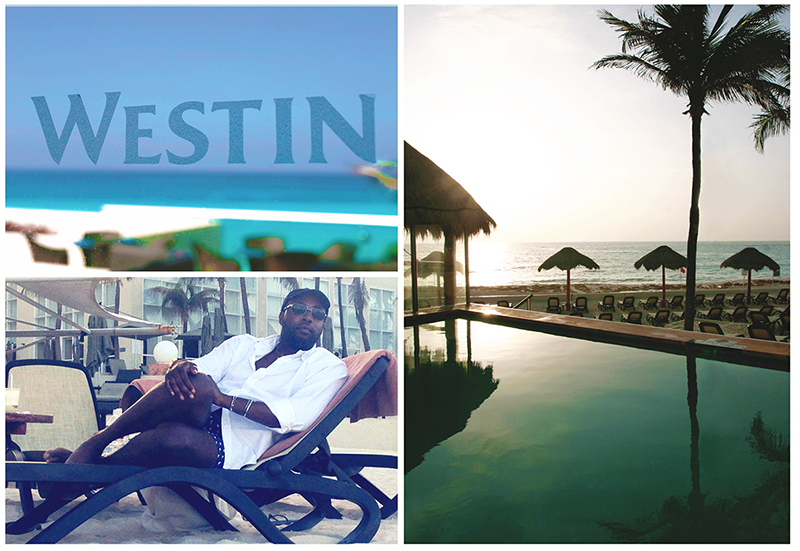 Christopher and I stayed at The Westin Cancun Resort & Spa in Cancún. Our favorite part of the hotel was a toss-up between the never-ending supply of delicious food and the beautiful white-sand beach directly in front of the hotel. We opted for the Westin because the price was fantastic, and because it had incredible beach-front views on the front side and tranquil lagoon views from the back of the property. The hotel takes up prime real estate at the southern tip of Cancun (Club Med was the only hotel further south), which means it's located at the quieter end of the “hotel zone”. That was perfect for us, because we were able to spend our days relaxing on the beach, and it was quiet and peaceful at night when we were ready to sleep. We didn't have to venture far to get to the “party zone”, but we also didn't have to deal with the noise of drunks 24/7. 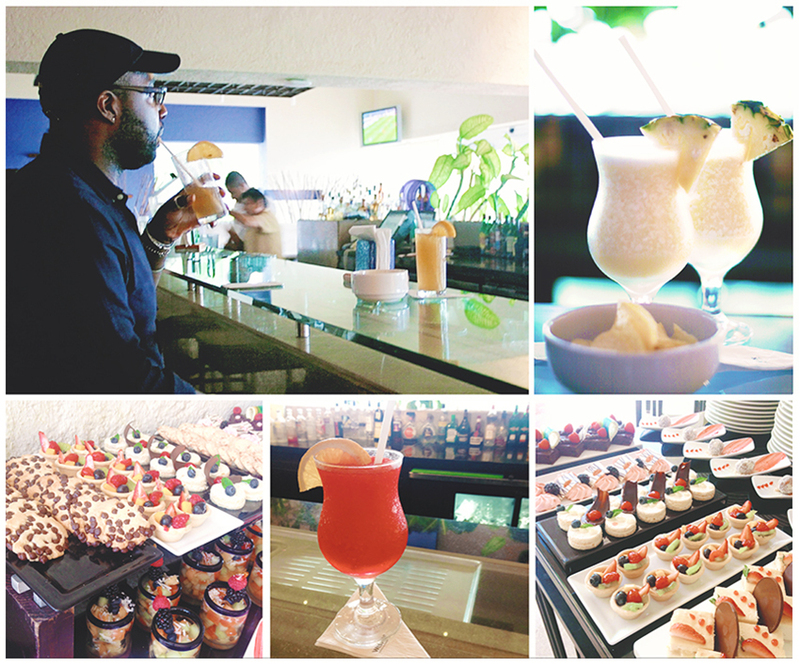 The drinks and desserts at the Westin Cancún were EASILY worth all the calories we consumed. Christopher and I still text pizza pics to each other saying, “Remember that pizza by the beach in Cancún? Best ever!” It was THAT good. Top perks of the Westin: Free WiFi throughout, absolutely incredible views of the turquoise blue waters of the Caribbean from the pool area at the front of the hotel, bonus views of the lagoon on the back side (there were multiple hammocks where you could relax while ocean breezes drifted through the palms), the complimentary breakfast buffet where we stuffed our faces each morning, happy hour at the bar, and some of the best wood-fired pizza we've ever had from the hotel's own restaurant on the beach. Our tour was an all-day trip that included Cenote Hubiku, a jungle tour to meet local artisans, a buffet-style lunch, a visit to UNESCO World Heritage site Chichén Itzá, and a brief stop in the beautiful town of Valladolid, Mexico. FYI: The vans pick up at any hotel on the Cancún strip for this particular tour. It was so nice taking an air-conditioned bus and sleeping while someone else did the driving! The guides were very knowledgable and I'm told they pointed out lots of interesting details about the region — which I missed because I was snoozing. Go figure! If you plan to swim in a cenote, don't forget to bring your bathing suit! There are private places to change once you arrive, so there's no need to wear one under your clothing and be uncomfortable during throughout the rest of the day. Swimming isn't mandatory, so you can wander around and explore the area if you prefer. Upon arriving at the cenote, we had to walk through a touristy shop filled with vendors hawking their souvenirs. It's a bit annoying, to say the least! Unfortunately that's pretty standard practice for tourist attractions in Mexico. If you decide to purchase anything, it helps if you speak Spanish and can haggle in the vendor's native language. Even if you don't speak Spanish, you should still attempt to get a lower rate. The majority of the items are overpriced and mass produced, and the vendors anticipate bargaining. You'll have to stroll through the touristy building to enter the grounds of the cenote, and vendors are slightly pushy about attempting to sell their trinkets. 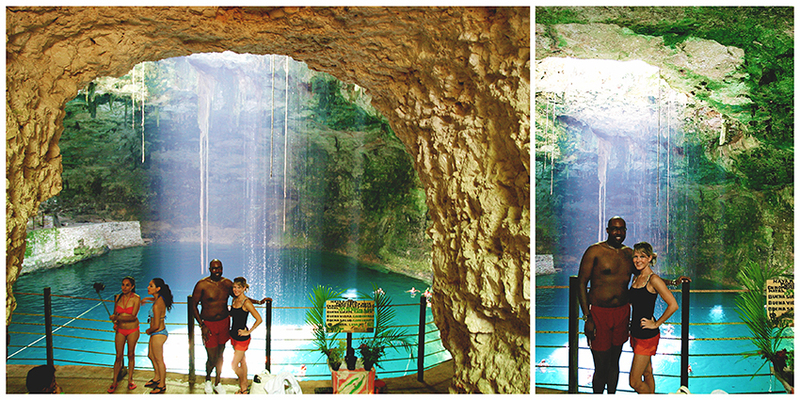 Once on the cenote grounds, head to the (very nice and clean) bathrooms to shower and change into your swimsuit. Once we made it past the souvenir shop, a photographer asked us to pose together for a picture. We obliged, and later you'll learn why he needed the photo! 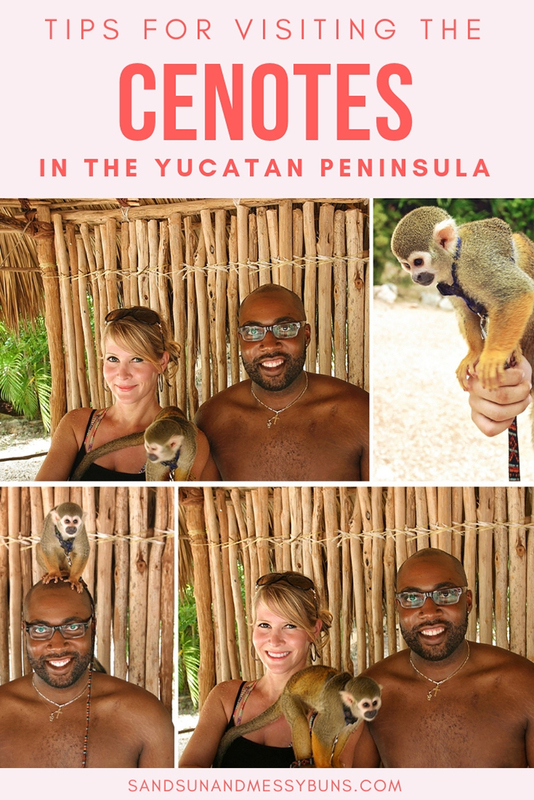 After our snapshot, we had the option of swimming in the cenote or visiting the Don Tedeo Tequila Museum and sampling tequila. Since I have a habit of making very bad decisions when I drink tequila, we wisely opted for the cenote! Cenotes were considered sacred areas to the ancient Mayans, and their openings were believed to be a gateway to an underworld inhabited by Chaac — the God of Rain. Although the cenotes are spectacularly beautiful, the surface below many of them is littered with bones from both humans and animals. It is commonly believed that the remains were from sacrificial offerings during Mayan eras of extreme drought. Both people and animals were tossed into the deep waters and left to drown in an effort appease Chaac and bring much needed rain. Divers have also discovered gold and jewels. When entering a cenote, please keep in mind that you are a guest in a sacred place and act accordingly. 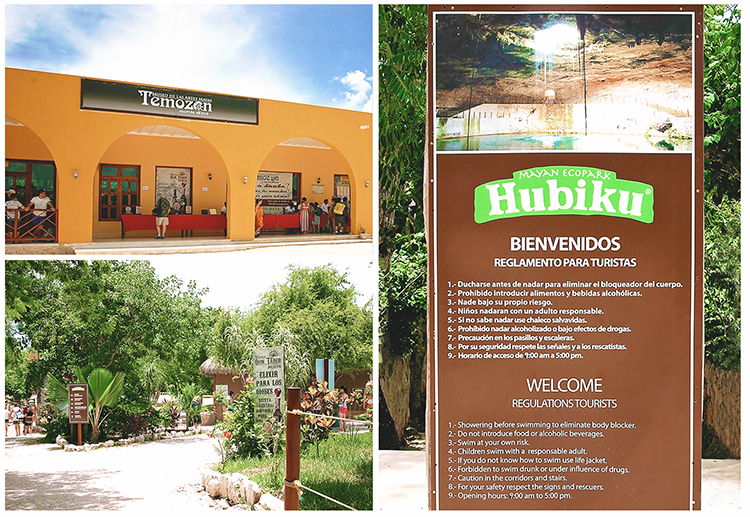 Before we could enter Hubiku Cenote, we were required to visit a shower area to rinse off, change into bathing suits, and stow our clothes in a locker. With hoards of tourists visiting Mexican cenotes each year, this process is necessary to remove sunscreen, oil, and perfume residue from the body so the cenotes will remain clean and pure for many years to come. Life jackets are available near the lockers, and towels are provided with the entry fee. Since our tour was all-inclusive, we didn't pay anything. 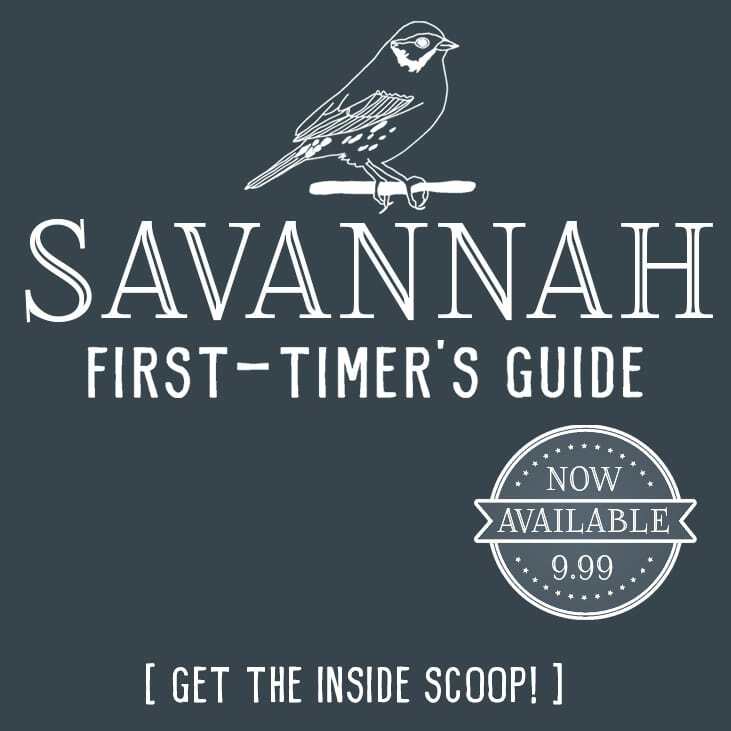 If you're visiting on your own, expect to pay a nominal fee (less than $3). TIP: Keep your flip flops with you and wear them down to the cenote area since the walkways are scratchy on the feet. A cenote is actually a sinkhole that extends to the groundwater table. It is formed when limestone collapses to expose a window into beautiful underground river systems. 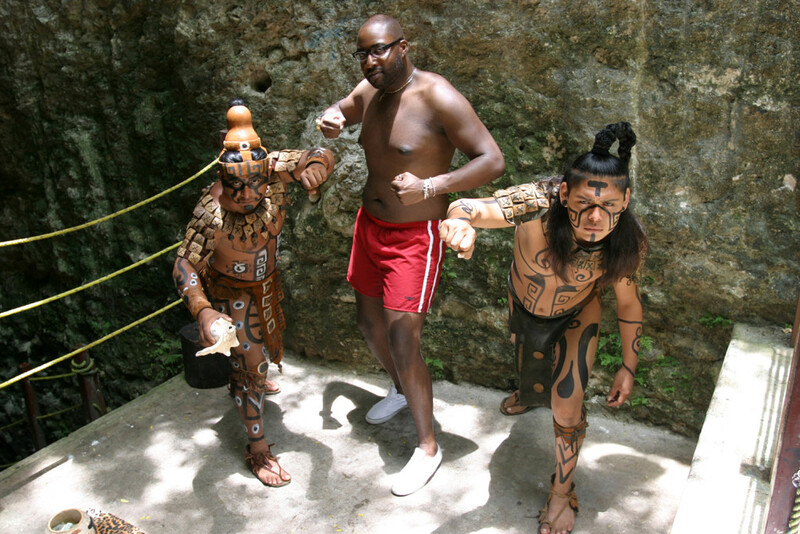 As you begin the trek down the stairs into the cenote, there's a platform halfway down where you can pose with men dressed as ancient Mayan warriors. Christopher took full advantage of this to show off his fiercest warrior pose. FYI: Tips aren't mandatory, but they are appreciated. It's a good idea to bring pesos along during your tour, because there are numerous opportunities for tipping. Cenote Hubiku is semi-open, so when you're inside looking up, you'll see a large hole with sunlight streaming through to illuminate the water below. There are also long vines hanging down from the ground above and the water is very clear. I handed my cell phone over to one of the performers so he could take a couple quick shots of us at the entryway. The water is deep shade of turquoise, and the walls appear very mossy green from the algae. It's pretty magical! Here's a wide angle shot of Hubiku Cenote, where you can see the large opening above and some of the vines hanging down. You can sit on the edge of the platform and dangle your feet in the water if you don't want to swim. Once in the cenote, Christopher jumped in the water first. He said it was refreshing, so I boldly stuck an exploratory toe in and thought it felt pretty good! As soon as I climbed in, I discovered he stretched the truth slightly to get me in the water. Trust me when I tell you the cenote water is very cold once it hits your tummy!! I wimped out long before he did and climbed out after less than 10 minutes. FYI: Most of the guests agreed with Christopher and found it refreshing. Cenote diving is a very popular activity, but we didn't spot anyone diving during our visit. Christopher's favorite part of the day's excursion was swimming in the cenote. He stayed in until the guides made him get out. He said it's very surreal if you find a spot away from the crowds and float on your back while looking up towards the ceiling, so that's what he suggests you do. 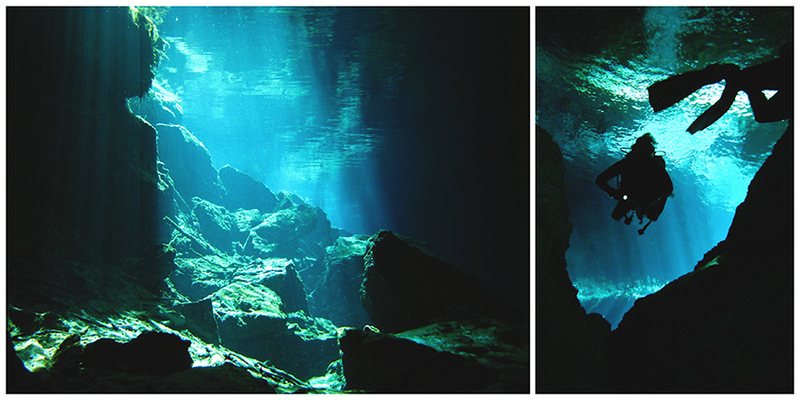 In case you're curious, this particular cenote is about 150 feet deep and it's full of tiny black catfish. We saw hundreds of them! They didn't bother us, we didn't bother them, and it was pretty peaceful to watch them swimming all around us. Once we finished our swim and headed back to our bus, we discovered we'd picked up additional passengers. They came bearing tequila from the museum and received a hearty welcome from our entire tour group! They proceeded to pour samples of flavored tequila and passed them out to everyone — even the teenagers, to our surprise. Next they produced bottles of tequila personalized with the photos they'd taken of us when we arrived on site. Those bottles were available for purchase, of course, and they said we wouldn't have any problems getting them through customs. Well played, tequila marketing team; well played. Of course we purchased one. We're suckers. Somewhere in Mexico there's a a very drunk and happy TSA agent. I'd like to imagine him toasting to us as he drank. You can save money by booking your reservations prior to your trip, which I definitely recommend. As I mentioned previously, our tour was an all-day event that included the transportation, lunch, pre-paid entry to all of the attractions, and two very knowledgeable guides who each spoke (fluently) in both English and Spanish. We really appreciated our guides!! They kept a close eye on everyone, and it's almost like the hustlers knew not to mess with us because our tour guides wouldn't put up with it. If you're a solo female traveler, I highly recommend this tour or a similar one. You're able to wander around and explore Chichen Itza, the cenotes, and Vallodolid on your own, which is nice. However, the guides made certain to double-count each person before moving to any new location. It's a great way to explore freely and know you'll be safe at the end of the day! Since many of the cenotes have openings in the roof, it's a good idea to bring sunscreen. However, you need to research carefully and make sure you bring a biodegradable option. Badger Broad Spectrum SPF 35 Sunscreen Cream – Badger sunscreen products are approved by the Environmental Working Group as reef-safe, biodegradable, and environmentally friendly sunscreen products. Reusable & Environmentally Friendly Rain Poncho – This poncho folds up in a pouch the size of your hand, so it's easy to stick in your purse or even your pocket. You'll be extremely happy to have it when afternoon rain-showers pop up! TIP: Help the environment and avoid disposable ponchos. Chapstick Medicated Lip Balm – It's drying to be out in the sun all day. I kept reaching for my chapstick, so I suggest making sure you stick one in your pocket for the trip. Underwater Ultra Wide Angle Lens Camera – The water in the cenotes is surprisingly clear, so I suggest bringing a special underwater camera along if you're interested in capturing some unique shots of the cenote. Underwater cameras are surprisingly affordable these days! Adult Inflatable & Portable Life Jacket – [optional, because you can rent vests on-site] There's no shame in using a life vest when swimming the cenotes. It's more relaxing to wear a life vest than it is to tread water for an extended period of time. This one folds down almost to the size of your cell phone, so it's easy to tote around. Waterproof Phone Case – Need I say more? Always take protection! You can read more about our trip to Cancún here, including the fun times we had setting baby sea turtles free. Have you visited a cenote before? If so, what did you like most about it? I'm so curious to know if your experience was similar to ours! this looks amazing! 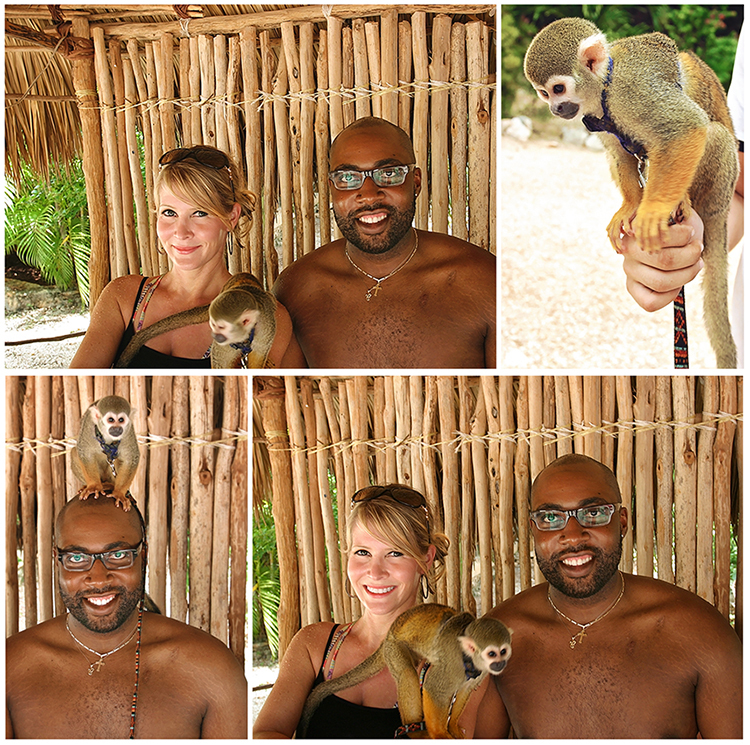 we just went to playa del carmen this summer. it was amazing, BUT we didn’t do anything like this because of the ages of the kids. if they were all a little older, we definitely would have tried this. we love stuff like this. I am so jealous. 😉 lol! Mexico looks like a beautiful country to visit! Sounds like an amazing trip. We always say we never travel enough. Same here. I would love to spend more time traveling and seeing the world! Swimming in the Cenotes is on my bucket list!! You’re welcome. It’s a unique experience! If you ever have the opportunity…go for it!